Archbishop Desmond Tutu, who won a Nobel Peace Prize for his work to liberate South Africa from Apartheid, just joined a long list of prominent Harvard alumni and current students who are calling for a week of civil disobedience at Harvard to push the university to divest from fossil fuels. Harvard Heat Week will bring together students, faculty, alumni and community members for a week of action to demand Harvard sell its holdings in the top 200 fossil fuel companies. According to event organizers, hundreds of people have already signed up to take part in the action since a letter announcing the effort was released on February 19th. 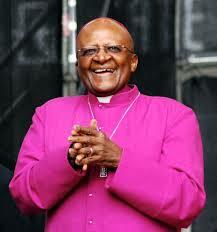 Tutu received an honorary degree from Harvard in 1979. In a speech at Memorial Hall in 1984, he called on the university to divest its holdings in apartheid South Africa. In 1988, he threatened to return his honorary degree if the university did not sell its roughly $230 million in stocks related to South Africa. Tutu went on to serve on the board of overseers from 1989 until 1992, when he had to step down to attend to difficulties in his home country.